I am so excited to post this!!! All of us over at A Blog Named Hero have been anxiously awaiting the arrivals of our newest little members. Today the first little boy joined our family. One of my design team sister's, Stephanie Britt and her husband welcomed baby Declan to their family. I am a huge fan of Steph's and I am so happy for her. We all got together and made cards for her new bundle of joy. 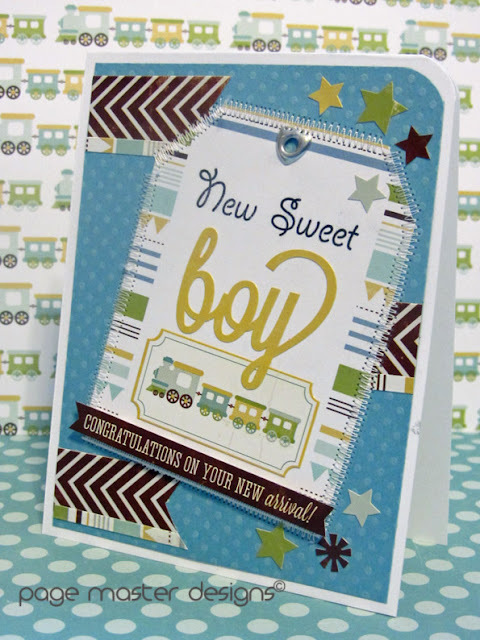 I used the new Bundle of Joy boy by Echo Park to create my card. "New and Sweet" are stamped with PTI. Wishing you and your little family all the BEST Stephanie. Love you!